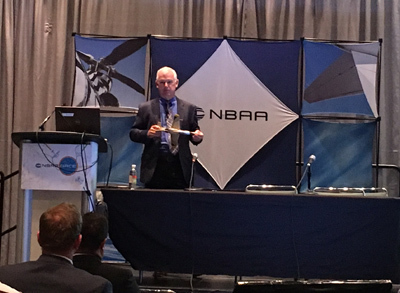 Lee Lauderback was asked to speak at the Orlando NBAA conference on November 2, 2016 about the importance of Upset Prevention and Recovery Training. Lee’s educational and entertaining presentation “Getting it Right when Things Go Wrong: Upset Prevention and Recovery Training” discussed in detail what you need to know and how with different techniques to learn“ what you don’t know”. For over 25 years the NTSB has recommended specific initial and recurrent training in Unusual Attitude Recoveries for pilots after studying various related accidents. Lee Lauderback has developed a teaching protocol that addresses the needs of corporate pilots in the area of Loss of Control (LOC) training in the type of aircraft they will be flying. The UAT program, a division of Stallion 51, emphasizes the importance of training in aircraft that directly correlate to the types of aircraft used by business and corporate aviation and utilizes a specially modified L-39 turbojet for their teaching platform. The UAT program is a multi-dimensional program that incorporates both, in the cockpit, hands on VFR and IFR flight segments in the L-39. Classroom instruction will cover Aerodynamics of Unusual Attitudes, the Dynamics of Recovery and the Aeromedical Aspects of Unusual Attitudes. Lee’s multi-media NBAA presentation was well attended and received by the professional corporate pilots that attended; sharing facts, figures, video and real life situations to illustrate the need to know how to get it right when things go wrong. Lee’s decades of experience as well as his educational background as a graduate of Embry-Riddle Aeronautical University in Daytona Beach with a degree in Aeronautical Science and Business Management makes him an excellent “higher education professor”. Lee is also the founder of “UAT” Unusual Attitude Training, a division of Stallion 51, that offers an FAA-approved three part UPRT program that uses a “PhD approach” to educating pilots in a specially modified and equipped L-39 Turbojet and P-51 Mustang. Lee started flying sailplanes at age 14 and launched his corporate aviation career immediately after college with the professional golfer, businessman and pilot, Arnold Palmer. Lee was Mr. Palmer’s chief pilot and the director of flight operations for 17 years, flying several different models of Citation jets, Learjet’s and a MD500E helicopter. Lee has been the chief flight instructor since Stallion 51’s inception amassing over 21,000 flight hours in all types of aircraft including over 9,000 hours in the Mustang. He is a certified single and multi-engine flight and ground instructor, holds an Airline Transport Pilot certification as well as instrument, helicopter and glider ratings. His expertise and vast experience in both the corporate and private aviation has earned him the distinction of being an FAA Specialty Aircraft Examiner. Lee is often called upon to flight test various Vintage planes, helicopters and Turbojets before they are accepted. Currently, Lee performs his Signature Solo Mustang Routine at air shows around the country. Lee was one of the first civilian pilots for the USAF Heritage Flight program, which showcases historic WWII military aircraft with current USAF military aircraft in unique formation flight. For many years, Lee has also instructed students at the Navy Test Pilot School in Patuxent River, Maryland and is a member of the Society of Experimental Test Pilots. Lee has expanded his aviation knowledge and experience to include having a chance to fly the F-15 Eagle, F-16 Viper, F/A-18 Hornet and test flown the Hawker Beechcraft T-6 Texan II. He also has over 2000 hours in sailplanes and has competed in many soaring contests and has held several sailplane records. Lee Lauderback has been the chief flight instructor for Stallion 51 Corp. since he founded the flight operation three decades ago. In that time he has amassed over 21,000 flight hours in all types of aircraft, including over 9,000 hours in the Mustang. His expertise and vast experience has earned him the distinction of being an FAA Experimental Aircraft Examiner, and he is often called upon to flight-test various vintage planes, helicopters and turbojets before they are accepted. Lee has expanded his aviation knowledge and experience to include flying the F-15 Eagle, F-16 Viper and F/A-18 Hornet, and he has test-flown the Hawker Beechcraft T-6 Texan II and also instructed students at the Navy Test Pilot School in Patuxent River, Maryland. Lee’s extensive aviation background and experience led him to be accepted as a member of the Society of Experimental Test Pilots at the 60th Annual Symposium on September 22-25, 2016. Even though Lee knew many of the SETP fellows, as an applicant he was required to submit a very detailed application, meet qualification and experience requirements as well as be recommended by at least three members of SETP in good standing. 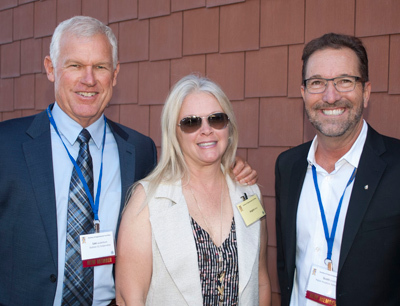 According to Rich Lee, “Lee came highly recommended by Fellows of the Society.” Two of the SETP members who recommended Lee this summer were aviation legend R.A. “Bob” Hoover and astronaut and Reno Air Race winner Robert “Hoot” Gibson. The Society of Experimental Test Pilots is an international organization that seeks to promote air safety and contributes to aeronautical advancement by promoting sound aeronautical design and development; exchanging ideas, thoughts and suggestions of the members; assisting in the professional development of experimental pilots; and providing scholarships and aid to members and the families of deceased members. SETP’s mission is to prevent accidents and loss of life by improving safety and design as well as providing a forum to disseminate information to those in the aerospace industry for the benefit of all aviation users. Lee Lauderback has focused on this same mission for the past 30 years, making Stallion 51 a world leader in WWII aviation. Robert J (Zak) Tomczak has joined UAT, LLC’s Team as Safety Officer consultant for its flight operations relating to the L-39 TurboJet which teaches Upset, Prevention and Recovery Training to corporate and business pilots. Mr. Tomczak is the President of Peregrine Defense Solutions, LLC, an independent aviation safety consulting company that offers program management to a select list of corporations involved in unique flight operations. Zak has flown over 3,300 hours and holds Commercial, Instrument, Single and Multi-Engine ratings. Zak’s vast experience makes him a perfect addition to the UAT’s team. For over 25 years the NTSB has recommended specific initial and recurrent training in Unusual Attitude Recoveries for pilots after studying various related accidents. Lee Lauderback’s presentation will address the value of Upset Prevention and Recovery Training and also the importance of training in aircraft that directly correlate to the types of aircraft used by Business and Corporate aviation. Real Time, Real Life training allows pilots to recognize and respond accurately and quickly before the situation progresses into one from which they may be unable to recover. Lee Lauderback often states “When confronted with a crisis, you will not rise to the occasion; you will descend to the level of your training”. Lee Lauderback, EAA Warbirds of America 2013 Hall of Fame inductee, is President and CEO of Stallion 51 Corporation located at the Kissimmee Gateway Airport, Florida. Since 1987, Stallion 51’s innovative and comprehensive curriculums have instructed thousands of pilots on the correct and safe methods of flying both the legendary P-51 Mustang and the historic T-6 Texan. 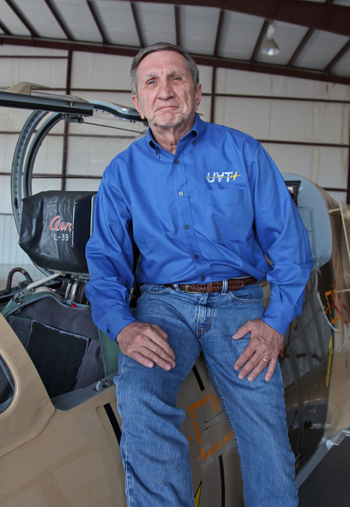 Lee is also the founder of “UAT” Unusual Attitude Training, a division of Stallion 51, that offers an FAA-approved three part UPRT program that uses a “PhD approach” to educating pilots in both the P-51 Mustang and specially modified and equipped L-39 Turbojet. UAT will be exhibiting at Orlando NBAA at booth 4683. Stallion 51 is a comprehensive aviation organization offering a wide range of services in historic aircraft including orientation flights in the legendary dual cockpit, dual control P-51 Mustang, historic T-6 Texan and L-39 TurboJet. Stallion 51 offers check-out and re-currency training, FAA Medical certification, aircraft sales and management. Stallion 51 has been a leader in WWII aviation for 30 years; bringing quality, safety, integrity and experience to aviation. Safety & Training: What About The Human Factor? FlyCorporate investigates the role of hands-on training in flight safety and talks to UAT President, Lee Lauderback, about the UAT philosophy for preparing pilots for upset prevention and recovery. Posted in Uncategorized	| Comments Off on Safety & Training: What About The Human Factor?